Amid the social and political tensions plaguing the United States in the years leading up to the Civil War, the North experienced a boom of cultural activity. Young transient writers, artists, and musicians settled in northern cities in pursuit of fame and fortune. Calling themselves “bohemians” after the misidentified homeland of the Roma immigrants to France, they established a coffeehouse society to share their thoughts and creative visions. Popularized by the press, bohemians became known for romantic, unorthodox notions of literature and the arts that transformed nineteenth–century artistic culture. Bohemian influence reached well beyond the arts, however. Building on midcentury abolitionist, socialist, and free labor sentiments, bohemians also flirted with political radicalism and social revolution. Advocating free love, free men, and free labor, bohemian ideas had a profound effect on the debate that raged among the splintered political factions in the North, including the fledgling Republican Party from which President Lincoln was ultimately elected in 1860. Focusing on the overlapping nature of culture and politics, historian Mark A. Lause delves into the world of antebellum bohemians and the newspapermen who surrounded them, including Ada Clare, Henry Clapp, and Charles Pfaff, and explores the origins and influence of bohemianism in 1850s New York. 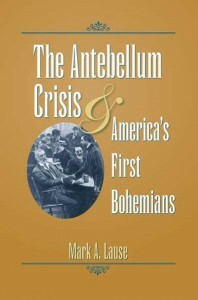 Against the backdrop of the looming Civil War, The Antebellum Crisis and America’s First Bohemians combines solid research with engaging storytelling to offer readers new insights into the forces that shaped events in the prewar years. Mark A. Lause is professor of history at the University of Cincinnati. His previous books include Young America: Land, Labor, and the Republican Community, The Civil War’s Last Campaign: James B. Weaver, the Greenback-Labor Party and the Politics of Race and Section; Some Degree of Power: From Hired Hand to Union Craftsman in the Preindustrial American Printing Trades, 1778–1815, and Race and Radicalism in the Union Army.